I suggest you read it in light of what God did not like then He still does not like or tolerate now. Here are a couple of quotes from Jeremiah 4. We cannot forsake what we can learn from the prophets and the history they speak of. The future can be seen in His positions toward those He loves. He has not changed. Israel was expected to wash their hearts. “…wash thine heart from wickedness,…” So are we. Yes, we do it! That same day in prayer (2-6-2016) I was impressed to write of what must happen before Jesus can return. These events are in no particular order except the first item which I believe triggers the rest. Its time has come. Enduring love saves, the good news of the kingdom, must be preached as a witness world-wide. “But the one who endures to the end, he will be saved; and this gospel of the kingdom shall be preached in the whole world for a testimony to all the nations, and then the end will come.” Matthew 24:13-14. The world-wide preaching or witnessing about “enduring love saves,” is an unfulfilled prophecy by Jesus. It is up to us to preach it. Every scripture about love applies. The resources for your messages are abundant. This message is good news but as an event spoken of by Jesus it also ushers in very difficult times ahead of Christ’s return. Many will fall away that did not have too if we fail to see our opportunity. The number of Martyrs (deaths) must be fulfilled. The many will love darkness and not light. John 1:5, 3:19, 12:46. The darkness of God will descend upon mankind in the Day of the Lord. I believe the restoration refers more to the restoring of the teachings of Jesus / God than restoring of the temple etc. Here’s why I believe this. Society world-wide is leaving behind the teachings of Christ and the bible for a worldly view. They embrace a kindness born of compassion for everything but life. It is a counterfeit lacking Christ. They are saving manatees and everything else as they abort babies by the millions. If the Devil were ever to be recognized for his sinister control over mankind, it is in this. Are we not in this condition as a nation, as a world community? Are we trading one king President for another right now in America, forsaking God? As a nation our representatives have renounced our heritage, plain and simple. We have renounced our real King, our God, by voting for those who support ungodly agendas’. “No!” you say? I am sure you are not thinking clearly. “As a nation, the blind are truly leading the blind.” Matthew 15:14. Our repentance from bitterness, anger, hatred and unforgiveness, our pursuing peace with all persons, to the extent it is possible for us to do so, is the restorative balm that brings our account with God back into a reconciled (zero balance) state. That we are permitted to do this is the good news of the kingdom. We are promised that we will receive what we give. Once reconciled by Christ’s death, this ongoing process of living our lives no longer requires a sacrifice by Jesus. It requires a sacrifice by us! We have been given everything pertaining to life and Godliness. Until our love for our fellow man is fully and compassionately evident, we cannot fully love as Christ loved us. Until then, whatever warmth we had in our hearts, there first because of Christ’s love for us, is cooling toward others. Our Christ-like surrender to God’s will, this witness of our absolute belief in God, His Christ Son and in resurrected life, will be looked upon by God with favor but with distain by the “many” that are doomed. Our faith will be (is) seen as extremism. Recent laws exist that speak of us as extremists; as enemies of the progressing blight over America’s majority mind. For some believers our “Crazy for God” witness and the ramifications of the “enduring love,” message will be reason to depart the faith. Dear brethren, followers of Christ, what may come easy to us because we prepared will be lethal to those barely able to walk by faith in the troubles ahead. The scales of our heart must tip toward God and His counsel in times of offense and trial. Tell them! The non-followers of Christ, and I do mean non…followers, will either join us or hate us. Their hatred will not be containable nor their wrath toward us. The tormenting contradiction in their souls will be volcanic and irresolvable. To them, we are either the face of love or the scowl of damnation depending on their heart. By then hopefully we will be love as God is love, enduring not judging them as He endured us at one time. God’s love surpasses what He knows about us. This is the love of Christ. It is also to be the love we possess and distribute. If we do, we will be filled up to all the fullness of God. Pray and intercede now for those whose path you may cross, whether it is today or in the future. Lost “saved” souls are dead men walking and do not know it. They are future victims of the Apostasy. Your seeds of love, the power of your understanding, may make the eternal difference for them. Do you think I speak only to you? What I teach or share, you are to teach or share! What you may already possess, give! What you may learn, apply then give. For God is our teacher and the lover of our souls. We live two lives, one as a nation, the second as an individual. As a nation we are swept into the flow of the majority. As the nation goes so go we. As the nation is perceived so are we. Only as an individual do we separate ourselves from that majority and we must do this or they establish our identity. God (if you believe in God, really believe) is watching, measuring, and weighing us in light of eternity. It is not to be an oppressive thing in our minds. It is simply a fact that we cannot escape His observance nor should we want to. He looks for maturity in Christ, not perfection as we understand the word. What God observes could be very positive and much more, very confirming of our true soulful belief and dependence upon Him. This is all the more positive as we turn to Him in our errors and receive the grace or distribute the grace toward others to help us, in our time of need. In and through Christ there is nothing God does not understand about our lives and our trials. In Christ the Father shows us what He expects of His own, relative to those difficulties. It was hard for Jesus. It will be hard for us. Acceptance can be peace. The potential value toward the unsaved or those squandering their “reconciliation,” by disobedience to Christ, is in our withstanding the difficult with and by grace and intercession. The more difficult our trial the more powerful our witness as we reflect Christ. How can Christ be dead or imagined when He is alive in us! Am I the killer or the killed? Better to be killed in righteousness than to be a killer of righteousness! For I announce the coming of the Righteous One for the righteous. I speak of how we maintain the righteousness freely given, for I speak only what He has already spoken. In doing so I leave you with what all the prophets left our forefathers. I leave you two choices. No not my choices lording over you but our choices as He is Lord or not. Not one single choice that is sufficient for a lifetime but many choices daily and in a lifetime. This is hard? We are to have the same Spirit that raised Christ from the dead! He should by now have brought to our remembrance the supporting assuring Words of Christ that ease the once sin sick soul. Our hope is in Him and His perfecting His work in us. What are these immediate choices, be they many, compared to doing right for a thousand years? And what is that compared to right choices forever? How can we except we learn? If we think it is not possible to be righteous now, with the grace and the gift of righteousness provided us to outweigh our fleshly challenges, to give us help in time of need, why would we think it possible to live righteously forever? Righteousness was given here to be accomplished by maintaining it here first, in preparation for eternity. He is coming for the righteous, those without spot or blemish, holy and blameless! How can that be if it is not possible for us to walk in righteousness until He comes or we die? He tells us how! Notice He cleanses us by the Word, His Words, His teachings given by the Father, by His life as Paul said in Romans 5:10 NASB, and He can only do so if we let Him do so assisted by the Holy Spirit whom God sent to lead us into ALL Truth. Our path to this righteousness begins with the “Alpha” of His death for us and the “Omega” of His finished work in us! As individuals, God forbid this would speak of you or I dear loved ones. Still Lord, help us see as You see. Let Your righteous standard of measure be ours as we examine ourselves. This verse is about those it does apply to. Lord, You know who. When it comes to controversy, I have learned that controversy feels like an attack on the heart but it often sets it free! Besides portions of my story, what you are about to read is very controversial or “outside the box” but so are the times we are in. The content is (from) beyond me but it is absolutely scriptural. In that sense it is not really controversial. It is however far “more” than we have understood. Like you, I am a beneficiary. In the Word of God we believe we have all truth but there is truth behind the truth, understanding yet to be grasped, and mysteries. “All truth” meant there was more understanding than Jesus explained. He may have told us cryptically but it would be hidden until the Holy Spirit illuminated our way to it. This also meant our awareness of the Holy Spirit would be required in our lives, so we would know for sure we were being enlightened. When His expanded truth occurs to us, God is kind in that we can simultaneously and without condemnation recognize our former lack while gladly embracing His greater. There are many areas of concern here. It is my hope they will ultimately validate the whole of this effort. Covering a multitude of interlocking truths, they clarify each other. Things we have looked at separately will now come together, interlocking with each other to become the greater, to become expanded truth. This is fully scriptural understanding that, it appears, has been withheld by God until now. Why are we seeing this now except the times demand our enlightenment and the Holy Spirit is fulfilling the plan? Like Jesus knew, God knew fear would come upon us if we were exposed to “all truth” prematurely. Back then, there was no supporting environment for what God wants us to know now. Now we must and I believe we will be motivated to seek, accept and walk in the understanding which deals with the prophesied events we are seeing. The scriptural parts and pieces were meant to add up, to bring greater understanding. In “all truth” we will find those added parts and pieces which can then come together in our hearts. Isaiah tells us who will be taught and how the teaching will come. This book has been written in much the same way it came to me: line upon line and precept upon precept, over 34 years. For those who have learned line upon line, precept upon precept, it is now time for those lines and precepts to gather. They are coming together synergistically, forming the critical mass, the fulfillment of prophecy that has been waiting for us, yes for us and circumstances, since Christ. You will see just how we are the initiators of the Lord’s return in a Christ-likeness the world has only had a glimpse of. Biblical concepts will now over-lap, coincide, augmenting each other, creating the holy-graphic image that God wanted us to see when it was time. It is a prophecy spoken by Jesus that is yet to be fulfilled. He has pointed the way to our divine assignment and our personal salvation. Now, just ahead of the darkness that precedes His return, there are things which must be embraced and in some cases cast off by us. We must stand in faith versus fear, grasping the disciplines that eternity requires of us, disciplines which must be taught by the mature, especially by the Five Fold League of Servants around the world. Casting aside fear, by the Holy Spirit “Followers” everywhere will then embrace our “God-date” (not mandate.) We will be empowered by our pastor’s in their obedient confidence and concern. Let us all, as God’s watchmen on the walls, blow this Shofar of a message. Let no blood but our own be upon our heads and it be washed away by this baptism in God’s precious grace. Cruising south along Interstate 95, through the rolling hills of North Carolina, I am alone in my escape. Few cars are seen in the distance in either direction. It has a calming effect as my mind wanders through the moments, the flashes of warning I had experienced in the previous few weeks. In my ignorance I had almost missed them. Some of those warnings were so profound I could not help but ponder my short-sightedness. If you knew what I did you would not wonder why I frequently checked the rear-view mirror. Their arm had a long reach if they decided to extend it. I knew they would, so I looked again and again until I saw it. The very thing I feared came upon me! A 250 page book, this price will increase to $9.99, sometime in the next two weeks. Is there a defining eternal life question? “Measure the message not the man or surely your soul will deceive you.” Michael Daniel Dooze. Shall we enter eternity naked of the disciplines critical to the governing of our eternal free will? If we have been forgiven and totally cleansed by Christ’s death, asking Him to BE Lord, do we realize what John, Paul and Jesus said we all must then know and do in order to maintain our new condition, to stay ready to actually be admitted into eternity? We know Jesus but does He know us? You say yes? So did I. Maybe He does but “Many” will say yes crying “Lord, Lord” only to be cast out. Oh He knew them but when it counted, they thought not and refused to repent. “How do you know that?” They were cast out because of lawlessness! When they asked, sought, and knocked about the beam in their eye, God told them the truth, it felt like a rock, so they did not respond in repentance! They basically said to God, “You don’t know me!” So Jesus in making His point demonstrated this reality and replied accordingly by speaking from God’s point of view, “I never knew you; depart from Me, you who practice lawlessness.” (Matthew 7:22-23 NAS) This verse points to something that we have control over. Does God know us? Does the truth prevail in us despite the pain of discipline? Do we hunger for the discipline of God that teaches us eternal rules? The Lord is adjusting our understanding, expanding on the truth we have believed. This preparatory act on His part should tell us our time is short. We know God desires that none should perish but that all should come to repentance. Does His expanded effort, as evidenced by the insight He is giving, not speak of urgency. Oh not tomorrow but as soon as a particular message is preached world-wide, as a testimony to Him, “then” things start to happen! The message is in an unfulfilled prophecy by Christ! All prophecy will be fulfilled! Is this a message from God in the Spirit of Daniel 12? Yes. I am convinced that “Exit Strategy, we initiate the return of Christ” is! Like the man said, “Measure the message not the man or surely your soul will deceive you.” Read the book, read the postings, see if your spirit does not witness to the scriptures and insight found therein. Then decide. For centuries many of us sincerely and faithfully have studied the Word and served Him. In reading “Exit Strategy” you will all ask as I did, “How could we have missed this?” It now appears to have been purposeful; intentional on God’s part. All of God’s ducks were not in a row yet. As my header portrays, like a red sunrise heralding the coming Storm, Christ stands before us. Will we see by His Words and those of Paul, John, and the rest? Do we discern the times? Will we gain understanding or cling to traditional thought? Will we see our destiny in this final revolution of love, this revival of revealing Him to the world by our testimony and by suffering this world and its unjust trials by grace, proving to whomever how real He is to us? Don’t allow yourself to be offended. If I offend you, and I am for you, then who are you stumbling over? 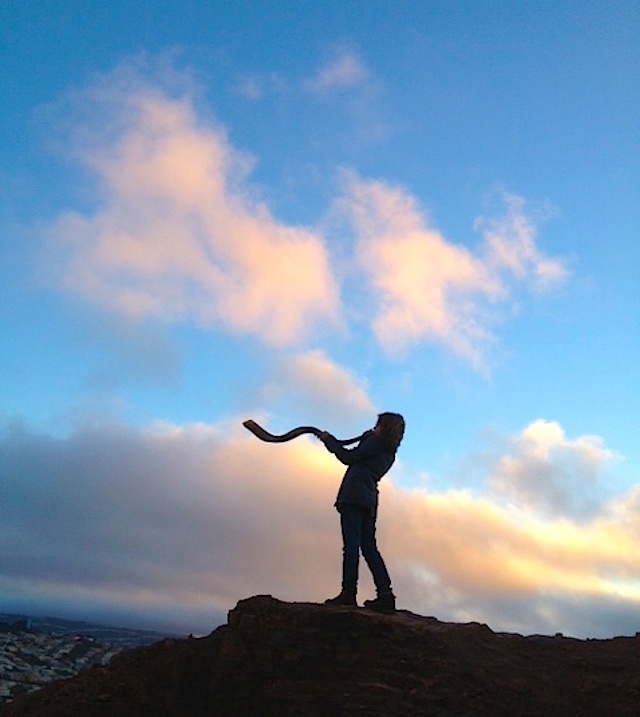 Is it I or the Word of God I quote, the Shofar I blow for your sake? How will you deal with a world of lawlessness; a truth meant to capture your heart and freeze it? I am telling you to turn up the warmth of God’s love, against that cold cruelty. Better we acknowledge Him, embrace the discipline that is Him and glory in His grace toward us! God is revealing more to us by extending the guiding hand of His Spirit. This will empower and enthrone His willing children with the lovingly enduring eternal character of the kingdom, as demonstrated by Christ! Many are moving away from God, or many have never really moved toward Him, even though they had an initial experience with Jesus and God. This exodus was foretold yes but all still have a choice! That which was prophetically foretold is being told daily on the news. The time has come. His word says, “few” will get this, yet He faithfully offers it to all. We all thought we understood. What you read in Exit Strategy and these posts will likely say otherwise as it did for me. The blessing is that now we CAN get it and have a knowing in our soul that cannot be shaken! God’s kindness and grace are being offered to us. Let us not miss the uniqueness of this offering nor its eternal repercussions. A great revival will come from the overturning of a false sense of security by the embracing of a scriptural security released by God in a contemporary environment where our own desire for security will serve His purposes and love for us. If we are sons of men and sons of God, we will chose now to fervently practice the eternal disciplines of thinking, speaking and reacting as Jesus the Son of Man did. God’s grace has made it possible for us to totally succeed! Jesus did not guarantee but gave the possibility of eternal life to us. Knowing our reconciliation would be purchased after His death, He taught eternal disciplines, before His death, that could be practiced on earth by those who were to be His followers, illuminating those practices within the Lord ’s Prayer, to carry us safely into eternity! This is everyone’s test. It is not “can we?” It is “will we?” He has made it possible and by His enduring love has shown us, as a Son of Man, that we can be as generous with grace as He was. Will we be? That is our defining eternal life question! Will there be a revolution of real love across the earth initiated by Him in us? It is not can we but will we embrace, His Exit Strategy! In doing so, WE initiate the return of Christ! Jesus was not perfect until He learned obedience and demonstrated it. “and being made perfect” is the word “teleioo” Strong’s 5048 as in to accomplish, finish, fulfill, make perfect. We had no chance with God until Jesus obeyed even unto death on a cross. His obedience and ours also, accomplishes eternal things! You are saying, “I am obedient, I do forgive.” Then you miss the point of these posts. OTHERS ARE NOT obedient and you know it. THESE are the ones God and the Devil are seeking now! If you are perfected in these Ways of Christ, you have a responsibility to engage those who are NOT! Out of stubbornness or resistant pride, they are lost and do not know it. Having obeyed enduringly and lovingly, evidenced by His intercession on our behalf, even after the horrendous treatment we doled out, He was placed as Lord over all things. We now prove our belief and faith in Him, His loving Way, and the resurrected life He has made possible, by our obedience. In this life, in our obedience to His Way, we are preparing ourselves for an eternal kingdom existence. Our king will rule. Obedience to Him is expected from a totally willing and forever grateful heart. A kingdom of peace is inhabited by those at perfect peace. There will never be another rebellion in heaven. If we make Him king while here, as demonstrated by obedience to His Way when we sense Him, feel Him, hear Him, seeing Him only with the eyes of our heart, then He knows and we will know with confidence that He is our God and Lord. The evidence must be there especially for our sake. That which we know to be absolutely a fact cannot be taken away unless we give it away, for He certainly loves us. The only question to be answered is, do we love Him, really…love Him. As we love Jesus we love the Father. Can you see yourself being spent by Him to accomplish His will toward others? Did the Father not spend His Son for our sake? Oh that our faithful obedience could accomplish such glorious results for His name’s sake, for surely “Jesus: Yahweh saves” is true and can still be true for some part of a lost and dying world which we were once a part. This is our value in God’s endeavor. What He did for us He will do for them but they must turn to Him. Let us never frown upon a call to obey, or to suffer in obeying. Let us see the glory yes but let us understand the glorious confirmation that takes place in God’s heart as we show Him that His efforts to reach, to teach, and to prepare us for His kingdom have not been wasted. By enduring love we truly are children of God. Our destination is sure in the Way, Truth and Life path Jesus has shown us. To follow Him there, we must follow Him here. Do we see what it entails? Let us each seek it and find it. Let us embrace the Law of the Spirit of Life and proceed to heaven under its covering! Let us walk in it to His glory, through the narrow gate, into His loving arms, with a “Well done My good and faithful servant” echoing through the halls of glory as we enter forever!